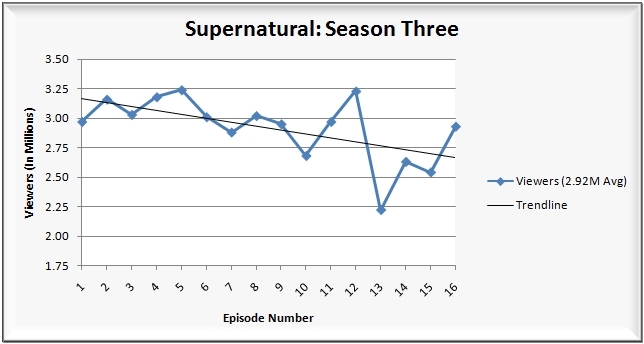 Because so many shows (7) had their season finales last night, I’ve included ratings charts (for the entire season) of each show, and you’ll find the decline/increase from the year ago numbers in parentheses below (HH= Households, V= Viewers and A18-49= Adults 18-49). Don’t forget to click through the jump for even more analysis. CBS took households and viewers on the strength of the season finales of CSI (Households: -12%, Viewers: -13%/2.72M, Adults 18-49: -24%) and Without a Trace (HH: -2%, V: +2%/0.23M, A18-49: -8%), but the network fell to third place among adults 18-49. That left ABC in first among A18-49 courtesy original episodes of its lineup, while NBC managed to just sneak into second among A18-49 courtesy the season finales of My Name Is Earl (HH: nc, V: +3%/0.19M, A18-49: nc), The Office (HH: +4%, V: +2%/0.19M, A18-49: +5%), and E.R. (HH: -14%, V: -12%/1.12M, A18-49: -8%). Fox stayed consistent in fourth place with its gameshow lineup, while The CW saw slight gains from the week prior courtesy season finales of Smallville (HH: nc, V: -9%/0.38M, A18-49: -6%) and Supernatural (HH: +6%, V: +8%/0.21M, A18-49: nc). CBS finished in first place for the evening with a 8.7/14 household rating/share and 13.36 million viewers, but was third among adults 18-49 with a 3.4/9 rating/share. 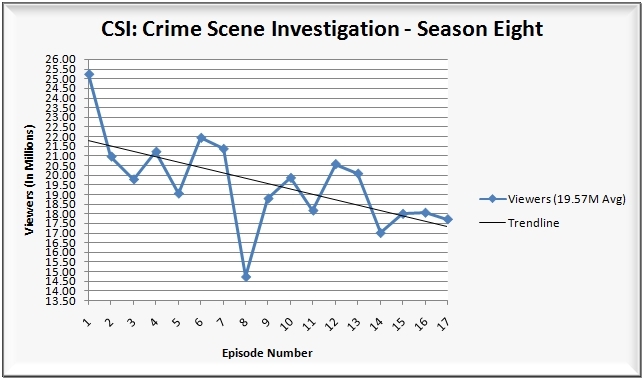 8:00 p.m.: A repeat of CSI: Crime Scene Investigation (5.3/9 HH rating/share, 7.81M viewers, 1.8/5 A18-49 rating/share). 9:00 p.m.: The eighth season finale of CSI: Crime Scene Investigation (11.1/17 HH rating/share, 17.73M viewers, 4.7/12 A18-49 rating/share). 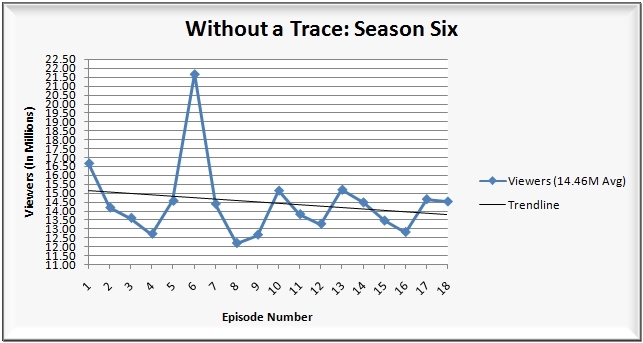 10:00 p.m.: The sixth season finale of Without a Trace (9.6/16 HH rating/share, 14.54M viewers, 3.6/10 A18-49 rating/share). ABC followed in second place for the evening with a 7.8/13 household rating/share and 11.68 million viewers, but managed a stronger first place finish among adults 18-49 with a 4.5/12 rating/share among adults 18-49. 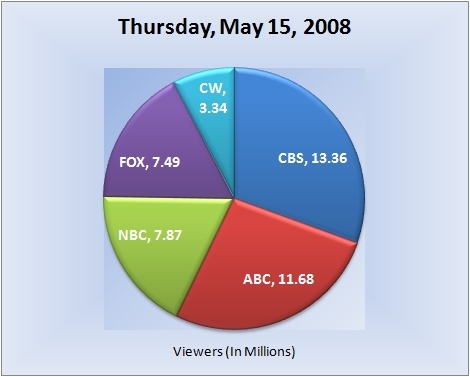 8:00 p.m.: Ugly Betty (5.9/10 HH rating/share, 8.47M viewers, 2.7/8 A18-49 rating/share). 9:00 p.m.: Grey’s Anatomy (10.3/16 HH rating/share, 15.18M viewers, 5.9/15 A18-49 rating/share). 10:00 (10:02) p.m.: Lost (7.2/12 HH rating/share, 11.40M viewers, 5.0/14 A18-49 rating/share). NBC finished in third place for the evening with a 5.1/8 household rating/share and 7.87 million viewers, but managed a second place finish among adults 18-49 with a 3.5/9 rating/share. 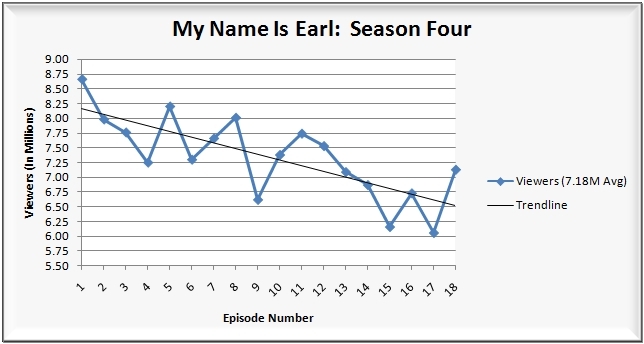 8:00 p.m.: The fourth season finale of My Name Is Earl (4.6/8 HH rating/share, 7.13M viewers, 3.0/9 A18-49 rating/share). 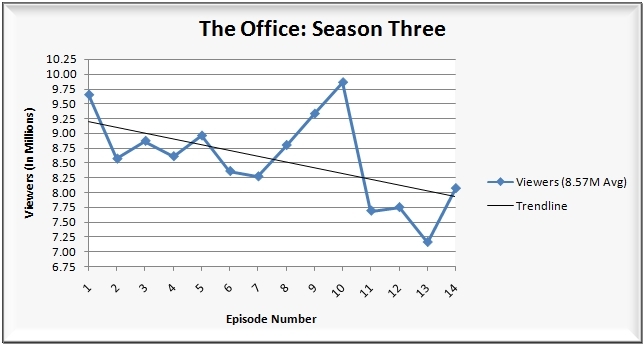 9:00 p.m.: The one-hour third season finale of The Office (5.0/8 HH rating/share, 8.07M viewers, 4.1/10 A18-49 rating/share). 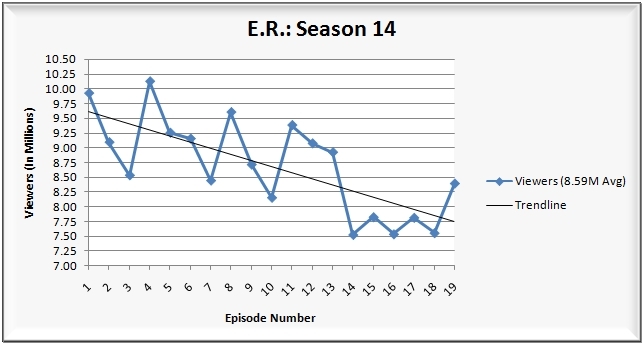 10:00 (10:01) p.m.: The 14th season finale of E.R. (5.5/9 HH rating/share, 8.39M viewers, 3.3/9 A18-49 rating/share). FOX followed in fourth place for the evening with a 4.7/8 household rating/share, 7.49 million viewers and a 2.3/6 rating/share among adults 18-49. 8:00 p.m.: Are You Smarter Than a 5th Grader? (5.3/9 HH rating/share, 8.32M viewers, 2.2/7 A18-49 rating/share). 9:00 p.m.: Don’t Forget the Lyrics! (4.2/7 HH rating/share, 6.66M viewers, 2.3/6 A18-49 rating/share). The CW finished in fifth place for the evening with a 2.1/3 household rating/share, 3.34 million viewers and a 1.4/4 rating/share among adults 18-49. 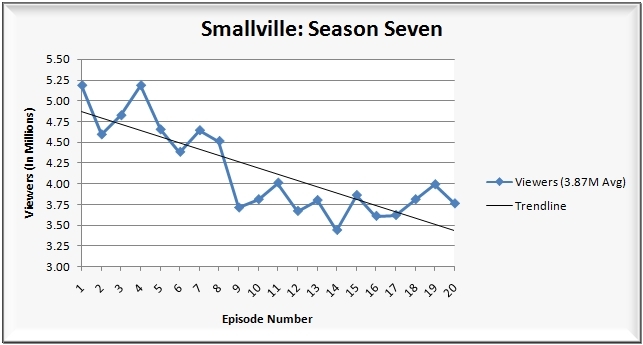 8:00 p.m.: The seventh season finale of Smallville (2.4/4 HH rating/share, 3.76M viewers, 1.7/5 A18-49 rating/share). 9:00 p.m.: The third season finale of Supernatural (1.9/3 HH rating/share, 2.93M viewers, 1.2/3 A18-49 rating/share). Note: Network average numbers from the week prior are based on fast national data. Comparison’s from the week prior (or episode-to-episode, etc.) on specific shows are based on final national data. Ratings for the current day are based on fast nationals. (Expect all three scenarios to be the case at all times, unless otherwise noted). The final rating for first-run episodes that aired this evening will be reported the following week. So for example, the final rating for tonight’s episode of “CSI: Crime Scene Investigation” will be reported in next weeks report for Thursday, May 22, 2008. Ugly Betty and My Name Is Earl are above water again! It’s nice to see Betty getting a more healthy 8.5ish million, although it’s far from out of the woods. And Grey’s Anatomy just keeps taking beatings… Ouch. Somebody finally noticed Supernatural. That show rocks. All the other shows are that night were great too.